Imagine a police officer knocks at your door. A hurricane has suddenly changed course – you have 45 minutes to evacuate. Can you gather all pets and put them in carriers in time? Do you have carriers for all of your pets? Are all your pets wearing collars with ID tags, their name, your name, your phone and emergency phone number? If your cat escapes the carrier and becomes lost could you provide a photo? Do you know where you can go in the event of an evacuation? 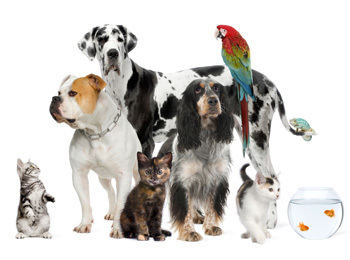 Do you know of any nearby pet friendly motels? Do you know where a pet friendly emergency shelter is? Is your vet’s phone number on your emergency list? Do you have an alternate plan in case you’re at work? 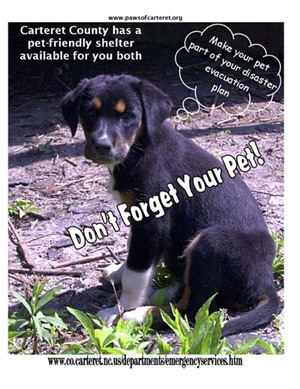 Where is your pet’s emergency “Go Kit”? Pre-Register You and Your Pets Today!